Click here to download the IDP2017 brochure. 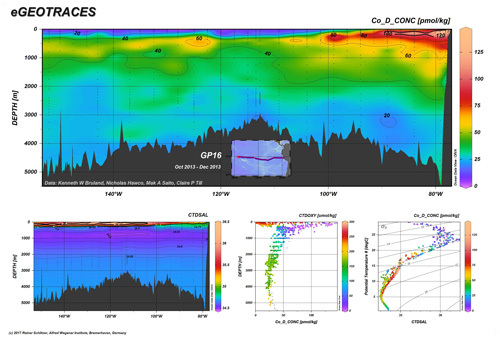 GEOTRACES is releasing the second version of its intermediate data product (IDP2017) gathering data acquired during the first 6 years of the programme to intensify collaboration within the broader ocean research community but also seeking feedback from the community to help us improve future data products. The new data product expands on the collection of results from the Atlantic and Arctic Oceans, released in 2014, and adds newer data from the Pacific and Southern Oceans. It contains trace elements that serve as micronutrients, tracers of continental sources to the ocean (e.g., aerosols and boundary exchange), contaminants (e.g., Pb and Hg), radioactive and stable isotopes used in paleoceanography and a broad suite of hydrographic parameters used to trace water masses. In addition, it provides biological data, for the first time. The digital data (available at www.bodc.ac.uk/geotraces/data/idp2017/ for bulk download AND https://webodv.awi.de/geotraces to download subsets of data) contains hydrographic and biogeochemical data from more than 1800 stations from 39 cruises. The data covers the global ocean, data density being the highest in the Atlantic. Data Access: Users are required to register and agree to usage rules asking for proper citations of the product itself and of the relevant original papers associated with the particular data used. The data is available in 4 formats: ASCII, Microsoft Excel, NetCDF and as ODV collections for use with the popular Ocean Data View software (odv.awi.de). A special effort has been made to link information about data originator, original publications and analytical methods with every data value. Proper linkage to and prominent display of originator information is used throughout the IDP2014 and considered important to provide credit to data producers. 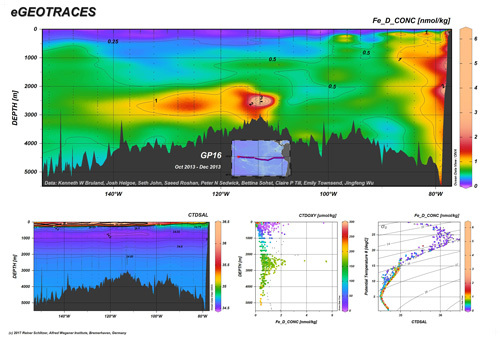 The eGEOTRACES Electronic Atlas (available at www.egeotraces.org) is based on the digital data package and provides section plots and animated 3D scenes for many of the parameters, allowing quick overviews of the occurrence of geochemically relevant tracers. 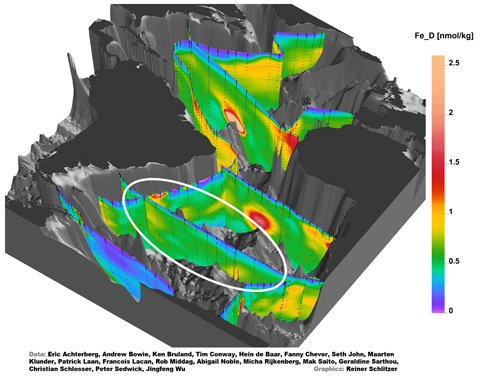 The 3D scenes provide geographical context crucial for correctly assessing extent and origin of tracer plumes as well as for inferring processes acting on the tracers and shaping their distribution. The numerous links to other tracers, sections and basins found on section plots and 3D animations allow quick switching between parameters and domains and facilitate comparative studies. In addition, eGEOTRACES can help in teaching and outreach activities and can also facilitate conveying societally relevant scientific results to interested laymen or decision makers. Usage: Users select parameters, cruise tracks and ocean basins using list-boxes and interactive maps. 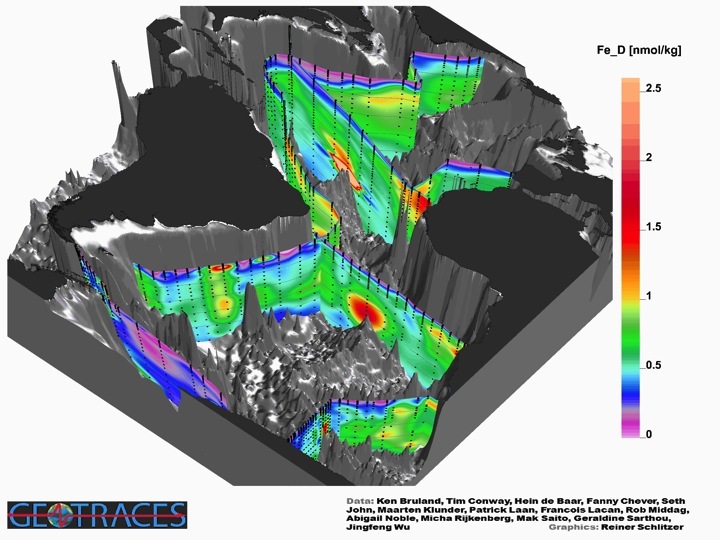 eGEOTRACES then presents parameter distributions along the selected sections, or animated 3D scenes showing parameter distributions along all available sections in the selected basin. Section plots and 3D animations contain the names of the scientists who produced or are responsible for the data. Section pages also contain a link to the original publications associated with the given parameter and cruise. These figures* compare full-depth distributions of iron (Fe) and cobalt (Co), along a North-South section between Peru and Tahiti. It is recognised that low oxygen environments are favourable to the occurrence of soluble dissolved Fe. However, the above figures show that while dissolved Co maxima (indicated in warm colours: red, orange, etc.) strictly follow the layers corresponding to the lowest oxygen concentrations, dissolved Fe maxima are surprisingly occurring below these layers. Hydrothermal dissolved Fe input is significant, while nul for dissolved Co. 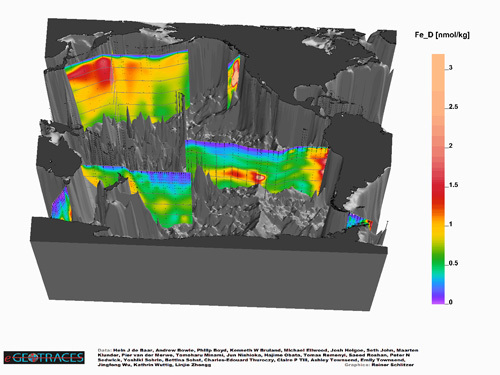 The figures* above present 3D scenes showing the distribution of dissolved iron (DFe) in the Atlantic (additional data in data product 2017) and the Pacific. The diversity of hydrothermal iron inputs is identified along Mid Oceanic Ridges in the two basins. Important release of DFe from the sediments are indicated along the African, South American, Asian and Peruvian coasts. *Note: all figures in this page follow the same colour code: warm colours (red, orange, etc.) indicate high concentrations.